Sun 'n Fun streaks on with Blue Angels and Stearmans cracking the air. Exhibits are active. People are shopping for the right airplane. Strong crowds were present at peak times. Opening day may have set a record. Generally vendors and customers seemed to be in good spirits. 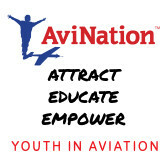 Recreational aviation looks healthy. As I spoke with vendors, one comment I heard repeatedly — freely offered but never requested — was "The economy is good. People have money to spend." This statement came up often enough to give it weight. Those of you shopping at home can have a little fun with PlaneFinder 2.0. Clicking or tapping a few categories will help you zero in on the best choices for you. Then you can click to articles or videos about them. Outbound — Rans has enjoyed quite a run with their newest, the S-21 Outbound. 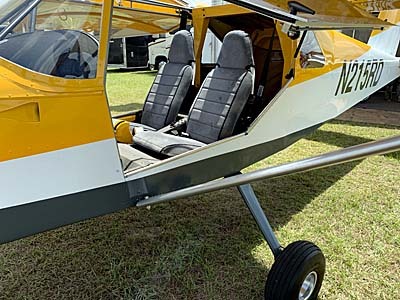 It is a handsome taildragger with performance to make STOL designs jealous. The trouble is, for the last two generations of pilots, nearly all were instructed in a tricycle gear airplane. Most have also heard stories about ground loops causing damage and hurting pride. They stick to tricycle gear and given their training, that's probably appropriate. For Sun 'n Fun 2019, Rans brought Outbound in tricycle gear. Despite what many might have expected the configuration looks good. The nose wheel doesn't affect handling or performance; "it flies the same as the tail dragger," said Randy Schlitter. 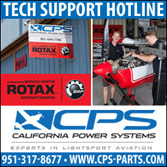 Outbound can be powered by a Rotax 912 with 100 horsepower or up to a Titan X340 with 180 horsepower. 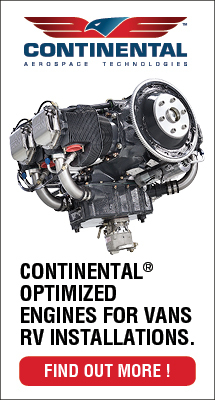 Randy said the climb with the bigger engine is impressive (850 to 1,500 fpm) but fuel usage rises noticeably (from 5.5 to 7 gph, and pilot real-life experience may result an even greater gap). Takeoff is also fast with the big engine: just over 300 feet to leave the runway and just under 400 to land …in skilled hands, of course. 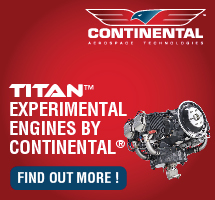 However, interestingly Rans quotes essentially the same launch and landing values for the Rotax 912. With the tricycle gear, you can have robust but smaller tires or you can opt for the tricycle version of bush gear; doing so gives greater prop clearance for larger diameters. 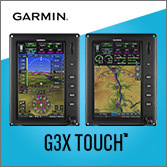 All outbounds can go both ways, taildragger or tri-gear. It takes about four hours to swap out the hardware but the airframe is built to accommodate either configuration. More Outbound info (pdf) for either configuration. See video below. 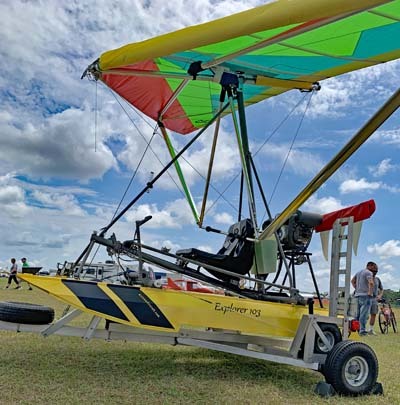 Amphib Trikes — Michael Percy and his Airtime Aircraft enterprise deliver a most agreeably priced seaplane, a combination of Krueger floats and a trike carriage built by his organization. Amphibious weight shift trikes are not common, but I have flown a few and they work reasonably well. In fact the way a trike leaves and arrives back on the water seems to jibe with the posture of a trike. If you watch a wheeled trike meet runway, you will observe that the main gear always touch first; the carriage is suspended under the wing in that way to facilitate rotation for lift off. Airtime has the trike carriage attached optimally to the floats to complement this quality of trikes and the results are good. I watched as Michael cycled the gear up and down (look for a mini video as soon as I find time). It's a remarkably fast moving system and appears very simple. 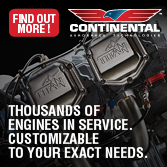 This system is used in two configurations on both the company's aircraft. 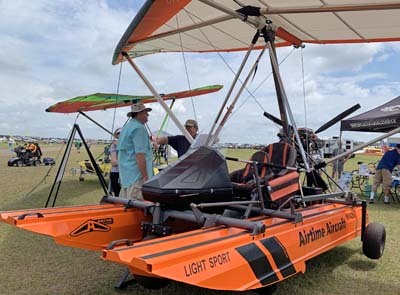 Airtime Aircraft offers two trike models. One is the Cygnet that became a Special LSA ten years ago. It has seen refinements but is essentially the same aircraft, probably because it works well. Explorer 103 is a legitimate Part 103 aircraft using the added weight FAA permits under guidance. To look at them, though, the two models appear much the same aircraft except for the extra seat and added structure to accommodate the 912 engine on Cygnet. More Airtime amphibious trike info. 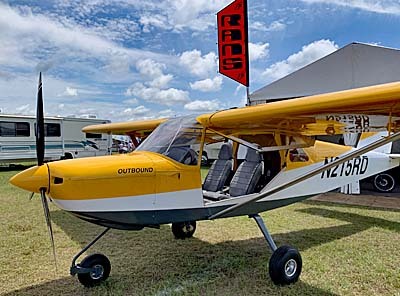 Electric PPG — One of the rigs I was most impressed with was an electric powered paraglider (PPG). The one I examined was for foot launch but I was told it would work well on a lightweight wheeled as are common in PPGs. I learned of this from Planet PPG owner, Paul Czarnecki, also a popular voice in Paradise City this year along with Stephanie Bensinger. These two did great work announcing activities in the area. The electric PPG was a creation of John Magdic in conjunction with Open PPG. This is a modern-style open-source project (think: Linux operating system) where you can purchase components to make your own electric PPG. How successful could this be? 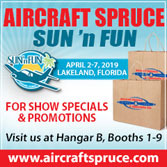 According to information provided to Sun 'n Fun judges, Magdic's four motor system can produce 165 pounds of thrust, comparable to the most powerful gasoline PPG units and substantially more than the average PPG. Magdic's Open PPG propulsion system has 30 pounds of batteries that can provide 30 minutes of power. 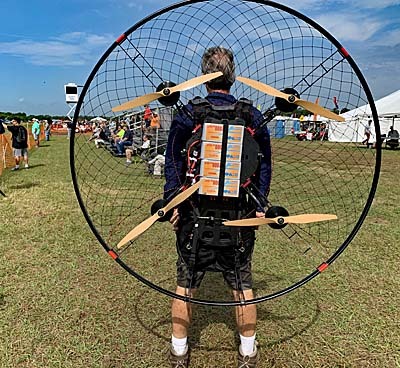 If you want more you could double the four to eight batteries and get an hour's flying time but your rig will then be of similar weight to a gas-powered PPG. For many, 30 minutes of flying time may be sufficient. 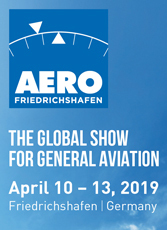 Cost, according to Czarnecki, is about $5,000 for the electric power frame, $3,000 for a wing, and if you want it, a wheeled carriage is about $1,500 making a full price for a complete aircraft less than $10,000. 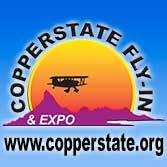 That's affordable flying! Sun ‘n Fun streaks on with Blue Angels and Stearmans cracking the air. Exhibits are active. People are shopping for the right airplane. Strong crowds were present at peak times. Opening day may have set a record. Generally vendors and customers seemed to be in good spirits. 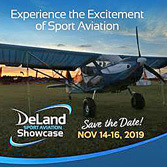 Recreational aviation looks healthy. As I spoke with vendors, one comment I heard repeatedly — freely offered but never requested — was “The economy is good. People have money to spend.” This statement came up often enough to give it weight. Those of you shopping at home can have a little fun with PlaneFinder 2.0. Clicking or tapping a few categories will help you zero in on the best choices for you. Then you can click to articles or videos about them. Outbound — Rans has enjoyed quite a run with their newest, the S-21 Outbound. 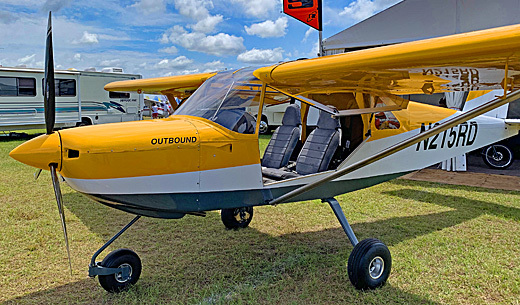 It is a handsome taildragger with performance to make STOL designs jealous.